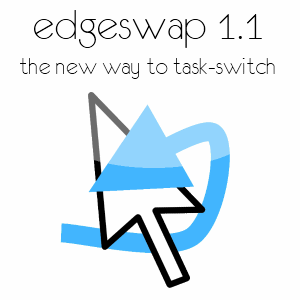 EdgeSwap is a task-switcher for Windows which allows you to switch between windows by simply moving your cursor to the top left edge of the screen. This allows you to switch quickly and effortlessly between open windows. When in use with Windows Vista or Windows 7, EdgeSwap displays live thumbnail images to choose between open windows, and shows application icons in Windows XP. Just hold your mouse cursor in the top left corner of the screen until the window you wish to open is highlighted, then move your cursor away to open that window. This is a Labs release, its likely there's a few bugs we need to iron out, and there is certainly a limited features set - let us know what you think in the forum.